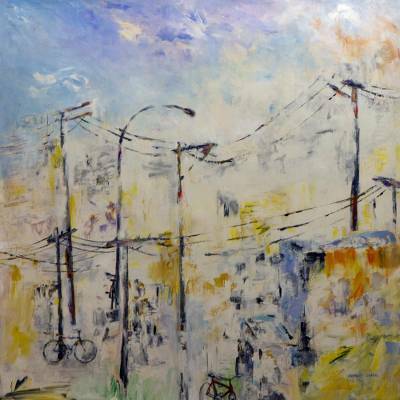 Original Signed Modern Fine Art Brazilian Cityscape Painting, "Urban Scene III"
Telephone wires faintly traverse the streets, like dancers in a melancholy ballet, and bicycles lean against light posts. The cloudy sky implies the smoke of industry, overshadowing yet not obscuring the colors of the city. A sense of energy pulsates at the heart of this painting by Shyrley Cabral. Titled "Cena urbana III" in Portuguese. "When I begin a painting, first I define the design, and soon after the colors flow, almost by themselves, at an incredible velocity." "Although I studied and worked in electronic engineering for ten years, I was always interested in the arts. In 1993 I began to study oil painting within an academic style, which didn't motivate me very much. Later I continued with a contemporary style, and a new horizon opened up for me, insofar as I got to know the works of various artists. The art of Ibere Camargo, De Kooning, Vieira da Silva, and Roualt serve as references in my work. In 1996 I was able to dedicate myself exclusively to painting, and since then I haven't stopped. "When I begin a painting, first I define the design, and soon after the colors flow, almost by themselves, at an incredible velocity. The result is a figuration with light abstraction. My themes are generally simple, everyday scenes that earn subtle movement through brush composition. "I feel compelled to express the idea that life should be lived in the best possible manner, and that we are all born to find happiness, and it is this which I seek to infuse in my paintings. I hope to humbly pass on a bit of joy and harmony to those who view my works. "To sell on the Internet is fantastic and contemporary. Novica is an excellent vehicle which divulges and makes accessible to the world the work of an artist. To know that somebody truly likes a work enough to invest in it is extremely gratifying."